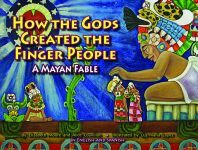 Shouting soldiers rip children from their mothers’ arms, and Gabriel and Evangeline are pushed onto separate ships. Evangeline spends years searching and praying for a safe reunion with her one true love, Gabriel. She follows Indian guides and smoke trails only to find she has again missed Gabriel by a few days. 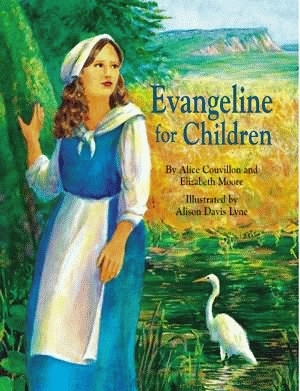 “And while her youth and beauty gradually faded, her love for Gabriel never died.” Read Evangeline for Children to see how these Acadian souls are finally united as one. Alice Couvillon and Elizabeth Moore are both Louisiana natives who reside in Covington and graduated from Newcomb College in New Orleans. Together they wrote the Pelican titles Mimi’s First Mardi Gras, Mimi and Jean-Paul’s Cajun Mardi Gras, and Louisiana Indian Tales. Alison Davis Lyne is a freelance illustrator who lives and works on a small farm in south-central Kentucky. She has done spot illustrations, magazine covers, greeting cards, traditional portraits, portraits in the style of medieval icons and also paints for the fine-art market. Her love of historical illustration comes from wanting to “see” history as a child.